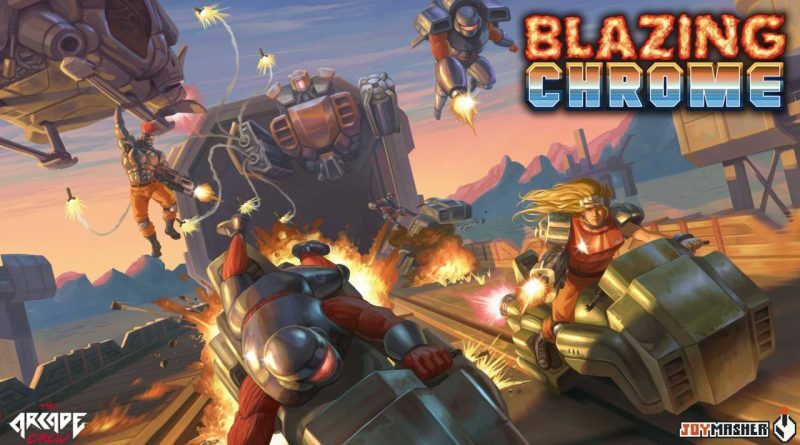 Publisher The Arcade Crew and developer Joymasher today that the retro-inspired co-op battle game Blazing Chrome is heading to Nintendo Switch in early 2019. Humans are expendable after an AI controlled robot army take over the world. They survive in hiding while their hunters rule the surface. When a small rebel group gets an intel about a big AI’s power plant, the machines strike their camp before they can organize an attack. A small group of rebels escape and go in a suicide mission to destroy this power plant. Choose to play as Mavra, a super badass human resistance soldier, or Doyle, the equally groovy and deadly insurgent robot. This suicide mission will result in heavy casualties and a ton of lock-and-load fast-paced action where scraping robots and blazing chrome with your powerful weapons is the only thing standing between you and your freedom. Fashion aficionados can also get a headstart on repping humanity’s salvation by donning a special Blazing Chrome-themed t-shirt in the upcoming Travis Strikes Again: No More Heroes for Nintendo Switch.